The name of the brand was inspired from the winged horse of Greek mythology called “Pegasus”. Initially it was founded as AsusTek Computer Inc. in 1989. This original equipment manufacturer(OEM) company has the product line of desktops, laptops, mobile phones, networking equipment, monitors, projectors, motherboards, graphics cards, peripherals, servers, workstations, and tablet PCs etc. Current slogan of the firm is "In Search of Incredible". Asus S1 Mobile Ultra Mini Portable LED Projector is suitable for professional and personal level of use. In Asus P3B model you will find brightest display of images with longer battery backup facility. 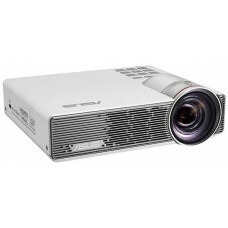 A full-size TV screen can insert into your pocket as Asus ZenBeam E1 LED projector. With these multimedia projectors you can enjoy games and cinema at home. Star Tech ensures the best price for Asus projectors all over Bangladesh including the market of Dhaka, Rangpur, Chattagram, Khulna and Sylhet. You can analyze the review of this reputed brand’s projectors and choose appropriate one for purchase. Enjoy EMI and online shopping facility for saving time and eliminating buying hassle.